Welcome to ReallyColor ("ReallyColor," "we," "us" or "our"). 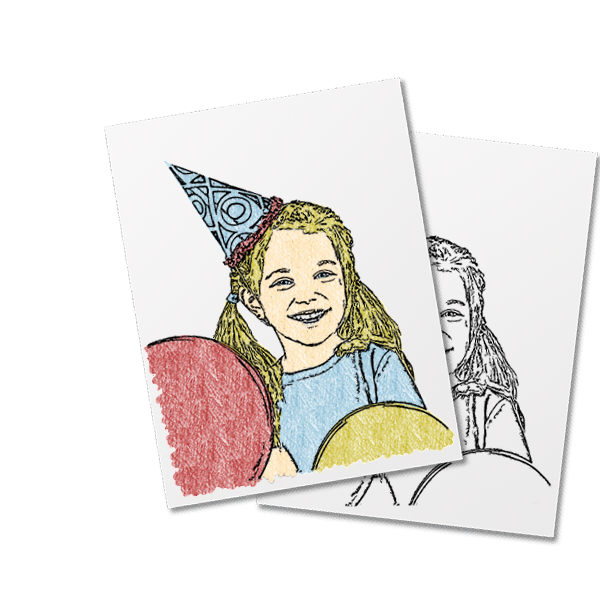 ReallyColor provides a fast, beautiful and fun way for you to turn your own photographs into printable coloring book pages. 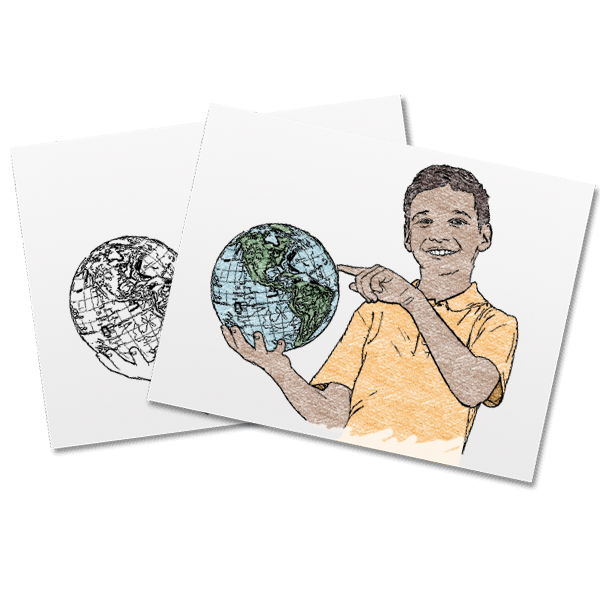 Just take a photo, use our web site to transform it into a coloring book page ready to be printed and shared! Your username, password and e-mail address when you register for a ReallyColor account. Profile information that you provide for your user profile (e.g., first and last name, picture, phone number). This information allows us to help you or others be "found" on ReallyColor. Communications between you and ReallyColor. For example, we may send you Service-related emails (e.g., account verification, changes/updates to features of the Service, technical and security notices). Note that you may not opt out of Service-related e-mails. Note about "Invite Friends" feature: If you choose to invite someone to the Service through our "Color with friends" feature, you may select a person directly from the contacts list on your device and send a text or email from your personal account. You understand and agree that you are responsible for any charges that apply to communications sent from your device, and because this invitation is coming directly from your personal account, ReallyColor does not have access to or control this communication. We use analytics tools and other third party technologies, such as Google Analytics and DoubleClick Cookies, to collect non-personal information in the form of various usage and user metrics when you use the Service. These tools and technologies collect and analyze certain types of information, including cookies, IP addresses, device and software identifiers, referring and exit URLs, onsite behavior and usage information, feature use metrics and statistics, usage and purchase history, MAC Address, mobile unique device ID, and other similar information. No personally identifiable information is ever captured by these third-party technologies. The third party analytics companies who collect information for the Service may combine the information collected with other information they have independently collected from other websites and/or other online or mobile products and services relating to your activities across their network of websites as well as online and/or mobile products and services. Many of these companies collect and use information under their own privacy policies.You may opt out of the DoubleClick cookie by visiting the Google advertising opt-out page or you may opt out of Google Analytics by visiting the Google Analytics opt-out page. When you use a mobile device like a tablet or phone to access our Service, we may access, collect, monitor, store on your device, and/or remotely store one or more "device identifiers." Device identifiers are small data files or similar data structures stored on or associated with your mobile device, which uniquely identify your mobile device. A device identifier may be data stored in connection with the device hardware, data stored in connection with the device's operating system or other software, or data sent to the device by ReallyColor. automatically update the ReallyColor application on your device. ReallyColor or other Users may run contests, special offers or other events or activities ("Events") on the Service. You will not be entered intoan Event unless you consent. We will not rent or sell your information to third parties outside ReallyColor (or the group of companies of which ReallyColor is a part) without your consent, except as noted in this Policy. We may share User Content and your information (including but not limited to, information from cookies, log files, device identifiers, location data, and usage data) with businesses that are legally part of the same group of companies that ReallyColor is part of, or that become part of that group ("Affiliates"). Affiliates may use this information to help provide, understand, and improve the Service (including by providing analytics) and Affiliates' own services (including by providing you with better and more relevant experiences). But these Affiliates will honor the choices you make about who can see your photos. If you remove information that you posted to the Service, copies may remain viewable in cached and archived pages of the Service, or if other Users or third parties using the ReallyColor API have copied or saved that information. Your information collected through the Service may be stored and processed in the United States or any other country in which ReallyColor, its Affiliates or Service Providers maintain facilities. ReallyColor, its Affiliates, or Service Providers may transfer information that we collect about you, including personal information across borders and from your country or jurisdiction to other countries or jurisdictions around the world. If you are located in the European Union or other regions with laws governing data collection and use that may differ from U.S. law, please note that we may transfer information, including personal information, to a country and jurisdiction that does not have the same data protection laws as your jurisdiction. We use commercially reasonable safeguards to help keep the information collected through the Service secure and take reasonable steps (such as requesting a unique password) to verify your identity before granting you access to your account. However, ReallyColor cannot ensure the security of any information you transmit to ReallyColor or guarantee that information on the Service may not be accessed, disclosed, altered, or destroyed. Please do your part to help us. You are responsible for maintaining the secrecy of your unique password and account information, and for controlling access to emails between you and ReallyColor, at all times. Your privacy settings may also be affected by changes the social media services you connect to ReallyColor make to their services. We are not responsible for the functionality, privacy, or security measures of any other organization. If you have any questions about reviewing or modifying your account information, please contact us directly at support@ReallyColor.com. Following termination or deactivation of your account, ReallyColor, its Affiliates, or its Service Providers may retain information (including your profile information) and User Content for a commercially reasonable time for backup, archival, and/or audit purposes. If you have any questions about termination or deactivation of your account, please contact us directly at support@ReallyColor.com. While ReallyColor is a business for children to enjoy, it does not knowingly collect or solicit any information from anyone under the age of 13 or knowingly allow such persons to register for the Service. In the event that we learn that we have collected personal information from a child under age 13 without parental consent, we will delete that information as quickly as possible. If you believe that we might have any information from or about a child under 13, please contact us at support@ReallyColor.com. In the event of the death of a ReallyColor User, please send us an email to the following email address: support@ReallyColor.com. We will usually conduct our communication via email; should we require any other information, we will contact you at the email address you have provided in your request. Wow, now THAT was a lot of legalese. In the end, the whole point of ReallyColor is to have fun, so, this Privacy Agreement also requires you to do that. Please have fun using the ReallyColor service!